Imagine swimming in calm, glassy water surrounded by a desert landscape peppered with volcanic islands. Now add the largest fish on the planet as your swimming companion and you’re experiencing an extraordinary and unforgettable moment. Swimming next to a whale shark is at the top of every diver’s bucket list. There aren’t enough words to describe the feeling of this interaction. Often times, words are not even spoken. Many are left speechless, shaking their heads in disbelief while producing a priceless smile. Try picturing what type of reaction you could have swimming next to an animal the size of a school bus? It is truly a positive, powerful and unique connection with nature. What makes this encounter extra special is the location where these pelagic giants are residing. During the summer months of the year, whale sharks migrate north to Bahia de los Angeles in Baja California, Mexico. Bahia de los Angeles is a small, quiet, isolated fishing town along the Sea of Cortez with a current population of roughly 800 residents. The locals have tremendous respect and appreciation for these whale sharks. Tourism within the town itself is relatively low. The majority of the boats out in the water are fishing boats targeting particular fish species, not whale sharks. Our boat may be the only one in the vicinity of the shark(s). Rarely are we competing with others for adequate time spent observing and swimming with these enormous filter feeders. The isolation and natural beauty of Bahia de los Angeles is very different and for most people, unlike anywhere else they’ve ever traveled. It’s a perfect destination suited for an inspirational adventure. The whale shark, Rhincodon typus, is the world’s largest fish attaining an average size of 4 to 12 meters (13 to 39 ft). Specimens between 5.5 to 10 meters (18 to 32 ft) are common. Rarely are these sharks seen above 12 meters (39 ft). Estimates regarding weight are not accurate, however, 15 to 20 tons (30,000 to 40,000 lbs.) are averages generally given. Despite its size, the whale shark does not pose significant danger to humans. The whale shark is a filter feeder – one of only three known filter feeding shark species along with the basking shark (Cetorhinus maximus) and the megamouth shark (Megachasma pelagios). It feeds on plankton including copepods, krill, fish eggs, crab larvae and small nektonic life, such as small squid or fish. It is often seen swimming with its large mouth open, up to 1.5 m (4.9 ft) wide, containing 300 to 350 rows of tiny teeth. These teeth don’t play a major role in feeding. In one of their filter-feeding methods, they suction water into their mouths at high velocities while remaining stationary and sometimes in a vertical position. Food moves through filtering pads that cover the entrance of their throats, allowing water to pass through while capturing food particles. Whale sharks possess a disruptive coloration displaying a “checkerboard” pattern of light colored spots with vertical and horizontal stripes against a dark colored background. Generally blue gray or greenish gray above and white below. Their “checkerboard” pattern is unique to each whale shark, comparable to a fingerprint for humans. Whales sharks are found in Bahia de los Angeles in summer and fall months from June to November, sometimes into the month of December. They thrive in water temperatures ranging between 20 to 25 C (68 to 78 F). Whale sharks are only one of the numerous species you’ll have the fortune to encounter during this adventure. Snorkeling with California sea lions (Zalophus californianus) will be part of our itinerary as well. We’ll transport you to a shallow rookery where you’ll have the opportunity to swim and snorkel among large groups of residential sea lions. These graceful pinnipeds will amaze you with their curious presence. One of the coolest snorkeling encounters you will ever experience. dolphins (Delphinus delphis). This species is smaller than the larger, more robust bottlenose dolphin (Tursiops truncatus). Many times we witness acrobatic leaps of incredible heights from these cetaceans. The most common whales seen in Bahia de los Angeles are fin whales, Balaenoptera physalus , second only to the blue whale as the largest living animal on earth. Fin whales can reach a length of approximately 27 meters (89 ft) and weigh up to 80 tons (160,000 lbs). They are often seen in pairs, sometimes in larger groups. These whales have been referred to as the “greyhounds of the sea” for being the fastest of the baleen whales. Humpback whales, Megaptera novaeangliae , are the next most common whales encountered in Bahia. They display the most social and acrobatic behaviors of any other baleen whales. Breaching, tail lobbing and pectoral flipper slapping are common displays of humpbacks. Humpbacks attain a maximum length of 15 meters (50 ft) and can weigh up to 40 tons (80,000 lbs). The largest animal on the planet can also be found in Bahia de los Angeles. The blue whale, Balaenoptera musculus , is observed more in the winter and spring months but has been seen during the summer as well. Other possible whale encounters may include Brydes whales (Balaenoptera brydei), Sperm whales (Physeter macrocephalus), Pilot whales (Globicephala macrorhynchus) and Killer whales (Orcinus orca). Although not commonly found in Bahia de los Angeles, orcas have a random presence there. The element of surprise is always waiting for us in Bahia de los Angeles. Mobula rays (Mobula sp.) are often seen leaping out of the water during the summer in Bahia de los Angeles. If you’re fortunate, you may witness mass amounts of mobulas schooling together. Round stingrays (Urobatis halleri) are seen throughout the bay and are very common. We generally see these rays in shallow areas. A wide diversity of marine birds grace the skies of Bahia de los Angeles. Blue footed boobies, frigate birds, royal terns, cormorants, pelicans, ospreys, oystercatchers, great blue herons, egrets, grebes, sandpipers, curlews and gulls are just some of the residents within the bay. 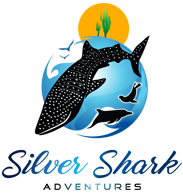 *The Whale Shark Adventure will bring a maximum of 4 people. We believe this significantly helps to reduce the impact on the whale sharks and any other wildlife we encounter during our trip. Furthermore, traveling with a small group will enhance your personal experience.